Shantigarbha is an experienced teacher of both Nonviolent Communication (NVC) and Buddhism; he is also a member of the Triratna Buddhist Order. Shantigarbha is an international NVC trainer, certified with the International Centre for Nonviolent Communication. He teaches on CNVC's International Intensive Trainings (IITs), is a CNVC Assessor-in-training, and serves on the Social Change and Peacemaking working group. He was given the name Shantigarbha, which means "seed of peace". 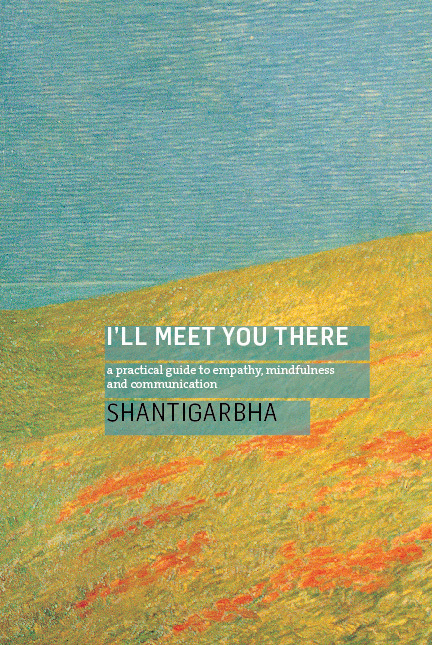 He is author of, I'll Meet You There: A Practical Guide to Empathy, Mindfulness and Communication. Empathy is an intuitive body-sense rather that an intellectual understanding of other people's psychology. Shantigarbha shows how we connect with each other in the space that opens up when we let go of our ideas of good and bad, right and wrong. When we feel safe and connected to ourselves, we don’t need to use these labels, and we are also connected to the people around us with a sense of compassionate presence, intense closeness, and empathy. To empathize with others, we need to learn how to empathize with ourselves, so that when we reach out, we do so from the inside out. To support this, in each chapter there are practical exercises for individual or group study. 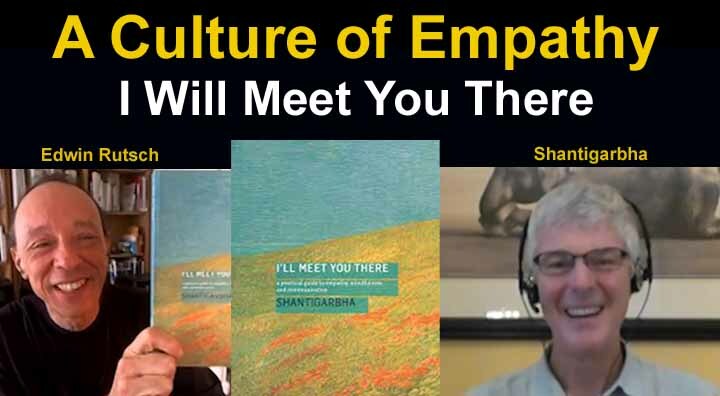 Shantigarbha also shows how through this empathy we can find a way to stay connected to our humanity, and contribute to a more peaceful world. Empathy: what, why and how? I’m a member of the Triratna Buddhist Order and a Nonviolent Communication (NVC) trainer. Empathy and honesty are the key components of both. Through NVC I’ve understood the ‘Bodhisattva ideal’ (Enlightenment for the benefit of all beings) teachings of Buddhism more deeply. This was how I imagined a ‘Bodhisattva’ would relate to other human beings: as continuously trying to enrich their lives. Gave me a glimpse of how I could serve myself and others. Immediately after his Enlightenment the Buddha faced a dilemma: he realized that it was going to be difficult for him to communicate Enlightenment to others. He decided not to teach. The Buddha looked out on beings in compassion, and saw them as lotuses at different stages of development in a pond. He saw them in terms of their spiritual potential – an empathic vision. He decided to teach what he had learned. A traditional description of the Buddha says that he comes into the world out of compassion ‘anukampa’ for the world. Anukampa means ‘trembling with’, even ‘resonating with’. So the Buddha trembles with, resonates with all beings. Empathy is the anukampa aspect of compassion. It is the reflective aspect of the Four Brahmaviharas: Loving Kindness, Compassion, Sympathetic Joy and Equanimity. I can still empathize with a ‘suicide bomber’, even if I don’t agree with their methods or worldview. It’s not the only choice we have: we could choose to embody our compassionate intention by choosing to stay connected to ourselves, by choosing to express ourselves, or by acting in some other way. Empathy is important because it helps create compassionate connection. Where else is empathy regarded as important? 1. Supporting connection, cooperation and social responsibility. 3. The basis of a moral sense – the ‘Ethics of Empathy’. 9. Mediation, conflict resolution and restorative justice. My Buddhist teacher, Urgyen Sangharakshita, argues that empathy is the basis of ethics and compassion: ethics is really to do with feeling solidarity with all life. It involves connection and imagination. We need to feel a connection with those whom our actions may affect i.e. care about the impact of our actions, and be able to imagine the impact of our actions on them. The Dalai Lama echoes this in his book Ancient Wisdom, Modern World: Ethics for the new Millennium. Modern moral theory also places the imaginative ability to empathize at the heart of moral motivation. Empathy probably goes back as far as the first mammals. According to modern neuroscience, our brains make use of special ‘Mirror neurons’ to create maps of the intentions of others, and to resonate emotionally with them. Not “Putting yourself in someone else’s shoes” – this will likely cause distress, which blocks empathy. Rather than putting yourself in their shoes, can you imagine/sense what it’s like for them to have them on? Intention: focus on your intention to connect compassionately. Presence: empathy is about ‘being with’ that person, giving our attention, our presence. Focus: on what is alive in the other person right now: their vedana (feelings) and their cetana (deeper motivations/ needs). Sustaining: If I have space to connect with myself, I have space to connect with others. Visit to New England prison. Mourning as a need: mourning for lost dreams and lost lives. Moment of shared humanity. Empathy is an aspect of compassion. Compassion by its nature extends even to our enemies. London 7/7 bombings. What are the needs on both sides? Personal connection with this incident. Self-empathy first. Guessing the needs of the ‘terrorist’: he deeply wants to be understood. He seems to want understanding for the depth of his motivation. I regain a sense of connection with humanity. If we can do this with someone we regard as ‘inhuman’, and label as ‘terrorist’ and ‘suicide bomber’, could we do it with anyone, and indeed, all life? Why? It’s the basis of ethics and compassion. It creates compassionate connection. How? Expanding our ‘natural’ empathy through practise.